When my daughter mentioned her favorite cake is Red Velvet Cake, I thought, hmmm, how could I translate that into one of my paintings without actually having to make one or buy one. . . . . 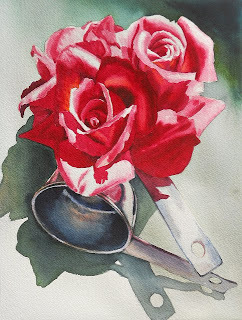 So, red flowers and measuring cups was an interesting take on the idea. I love your translation...it's perfect! Thank you Carol! She thought the roses were pretty. Thank you Anita, I wonder how many different ways I can interpret Cup of Flower . . . . I'm not intending to make a series of it but it seems like they just keep my interest. this is very pretty! I love this!Your an amazing artist! Bravo pour ces si jolies roses!